POSTED ROADS: Happy Birthday, Charles E. Pratt! Happy Birthday, Charles E. Pratt! It was on this day in history, March 13th, in the year 1845, that there was born in Vassalboro, Maine one of the most influential cyclists in American history - and one that you and Wikipedia have probably never heard of. Charles Eadward Pratt was born 164 years ago in Vassalboro on the banks of the Kennebec River to a prominent Quaker family. He grew up in Roxbury, Mass. (now part of Boston) and graduated from Haverford College in Pennsylvania in 1870. He was small in stature, rather frail and sickly, and given to bookish pursuits. He was a member of a number of literary clubs with names like the Papyrus Club, the Odd Volumes Club and the Société des Bibliophiles Contemporains of Paris (did I mention he was fluent in French?). He studied law and entered into legal practice, focusing on patent law. There matters may have stood, except that in the 1870s young Charles discovered bicycling. He took to the wheel with unbridled enthusiasm, his health and spirits soared, and he was soon doing century runs on his high wheeler. Drawing on his literary talents, he published in 1879 the first cycling guidebook in America: The American Bicycler: a manual for the observer, the learner and the expert. He followed that up in 1884 with one of the first full-length cycling "FAQs": What and Why. 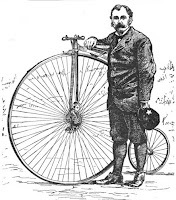 He became the editor of The Bicycling World and used his position in 1880 to call for a national gathering of "bicyclers" to form a national organization of cyclists, and later that year in Newport, R.I. the League of American Wheelmen was formed. The L.A.W. members elected Pratt their first president and he served two terms from 1880-1882. His cycling guidebook (chock-full of good information surprisingly still relevant 130 years later) brought him to the attention of the editors of Scribner's Monthly Magazine who approached him with the idea of doing a major article on the radical new sport. Pratt did them one better - organizing a special two-day "invitational" ride for all the bike clubs in the Boston area, called the "Wheel Around the Hub." Pratt's colorful article on the event, illustrated with some outstanding photographs, did more to popularize the new sport of bicycling than any other single publication. It was on the ride that Pratt came to the attention of Col. Albert A. Pope of Columbia Bicycles. The rather portly Pope (Pratt playfully nicknamed him "Colonel Bounce") was an aggressive businessman who often needed an army of patent lawyers, and he soon hired Pratt to head up his legal staff. The two men would leave their mark on the cycling industry that is still felt today. In addition to cycling sport and manufacture, Pratt was also a tireless advocate of cyclists' rights, leading the L.A.W. 's early legal battles for bicycle access to roads, parks, and trains, and promoting the League's efforts for Good Roads. Pratt's most enduring legacy comes from his behind-the-scenes work in promulgating the "golden rule" of bicycle advocacy: that bicycles are vehicles and that their drivers have the same rights and responsibilities as the drivers of other vehicles. It happened like this: in the 1870s concerned citizens in many U.S. towns and cities began to agitate for regulating the new menace on their streets - cyclists. Boston was no different, except for a young City Councillor named Charles E. Pratt. When the first motion came up to refer the matter of regulating bicycles in Boston to the hostile Committee on Public Safety, Pratt employed some deft parliamentary maneuvering to shift the proposal instead to the Office of the Police Commissioner. In so doing, he only had to persuade a single person to his views, not an entire committee. Pratt then went to work on the Police Commissioner, no doubt cornering him in one of the legendary "smoke-filled back rooms" of the social clubs of the day. Pratt convinced the Commissioner that he didn't have to add any new laws to the books regarding the use of bicycles, since bicycles were vehicles and thus the existing laws regarding vehicles would apply. The Commissioner's ruling established a solid legal precedent for the first time in the U.S. So there you have it. The next time you hear the expression "Cars, Bikes - Equal Rights" remember that you owe it all to the young man from Vassalboro, Maine. Happy Birthday, Charles E. Pratt! Thank you so much for this article, I'm writing an essay about cycling for uni and I've been looking for informations about Charles E. Pratt for hours! (And you're the only website that gives me proper answers) Bless you! You're welcome, Malory. Send me a link to your article when it comes out! New Kennebec Valley Bicycle Club Weblog Launched!